I love this arched plant stand. It holds at least 3 plants easily. If they are smaller plants you can put 2-3 on each base. It is a lot bigger than I expected and for the price it is a great value. It comes un-assembled and with no instructions. But it is very easy to figure out. Few parts to put together. Made of metal. 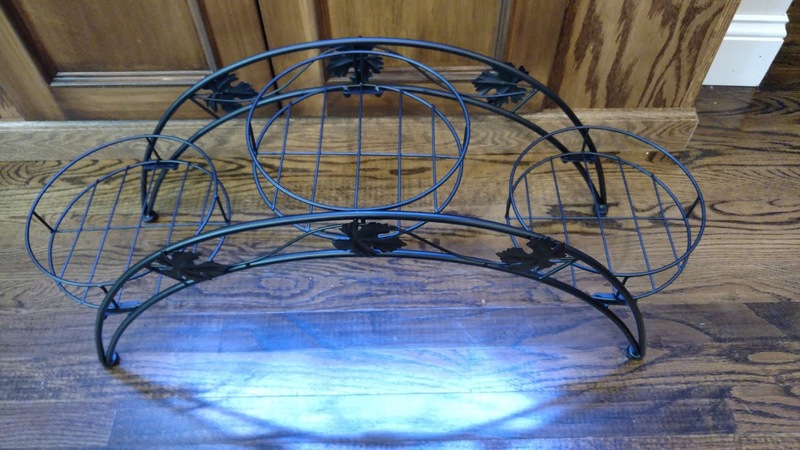 Arching metal plant stand with a classic bronze finish. A stunning display for your potted plants. 3 round shelves made of metal bars allow you to display up to 3 small planters (pots of plants / flowers not included). Approximate Dimensions: 26.6″ L X 9.7″ W X 11.8″ H.
4 sturdy, ball-capped metal supports and a metal railing on each tier helps keep both the display stand and your planters upright and stable. 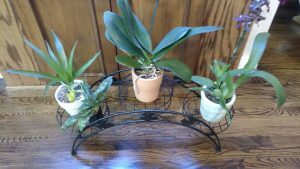 Sturdy metal material can hold different kinds of the potted plants. 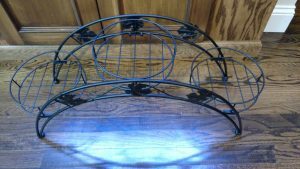 Beautiful arch bridge design potted stand for home and gardening fans.